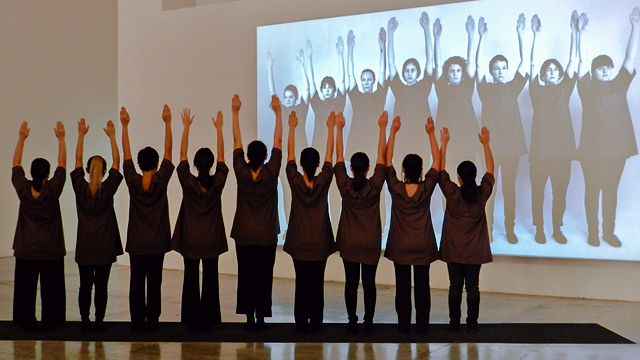 Re-Enactments runs until September 10 at Museum of Contemporary Art and Design. (SPOT.ph) You may have seen, in one way or another, the video of Marina Abramovic’s performance at the Museum of Modern Art after it went viral in 2010. It’s the one where the artist, clad in a red dress, is seated quietly across a table, inviting strangers (some are even Hollywood celebrities) to sit opposite her. They quietly stare at each other and occasionally shed tears. It became even more interesting when Ulay, Abramovic's ex-lover and former collaborator whom she had not seen in years, approached her. 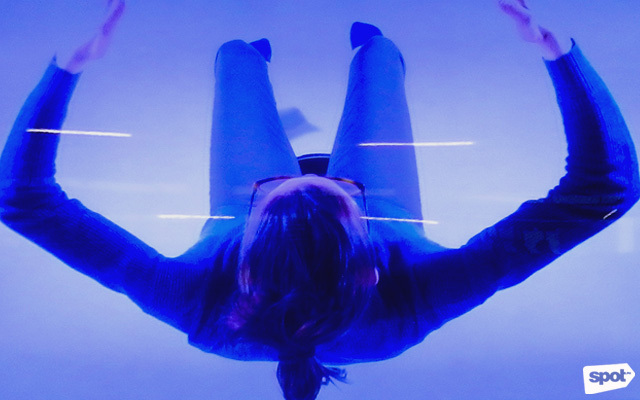 This show, titled “The Artist is Present” is a performance art exhibition that encourages the audience to participate and use their bodies to create art. It's not something most Filipinos are used to, but the Museum of Contemporary Art and Design opens that door with Re-Enactments, an exhibit that gathers works of eight artists from different countries, until September 10. In the show, the focus is steered away from the artists’ concrete presence in their artwork and in the exhibit. 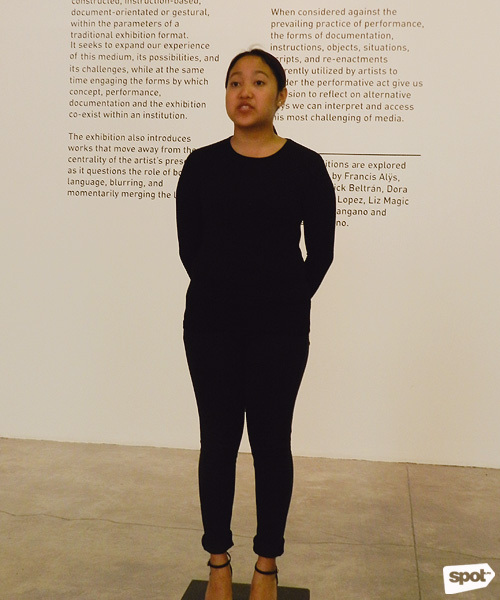 Instead, the emphasis is directed towards how the artists use language and the human body in a performance while appealing to the viewer’s senses. 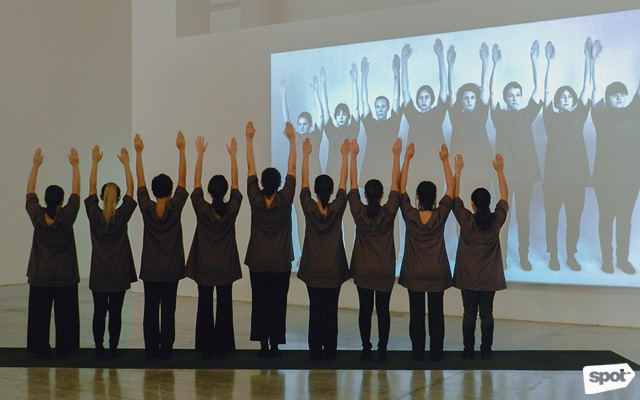 “There is No There” features a group of women dancers engaging in a carefully choreographed performance of the piece while a video in a large HD format plays in the background. Accompanied by a cellist playing simultaneously, the dancers re-enact familiar gestures and movements from the large video behind them. Influenced by the Blue Blouse Theatre Collective of the 1920s, the Mangano sisters explored movements and gestures we frequently see while watching the news. In watching the performance, the viewer should muster the courage to face a group of women pointing their fingers at you, which could possibly make you anxious and feel a hint of unknown guilt. The second live performance for Re-Enactments highlights humor and wit—Dora García’s “The Artist Without Works: A Guided Tour Around Nothing.” In this act, the performer raises a newspaper and holds a pedestal as she calls out to people who would like to walk with her on a tour around....nothing (yes, nothing!). The artist then takes the group around the museum, stopping at corners and providing insights to the “works of art” she wishes to present. She then starts her monologue on art and politics, driving the audience to laugh and react; it also ventures to serious points raised as she proclaims that there are only two kinds of artists in this world: the failed and the unknown. 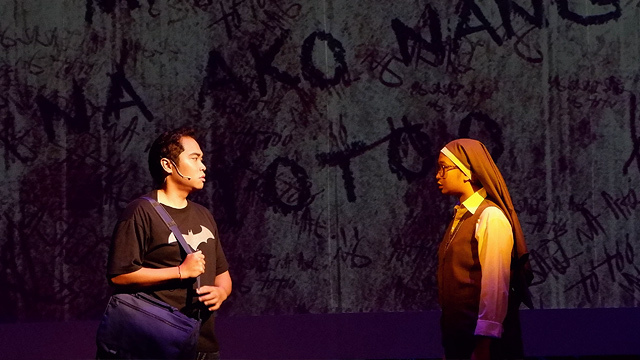 Aside from live performances, the exhibit also features performances captured on video. One of which is “Re-enactments” by Belgian artist Francis Alÿs. The main title of the show is lifted from this piece. The work contains a two-channel video installation synchronized to show similar footages, except that one is only a re-enactment. In the actual footage, the artist is seen illegally purchasing a gun from a store in Mexico before he brazenly strolls the city, walking past different establishments and groups of people while holding a loaded gun. It took 12 and a half minutes until the police finally apprehended him. The following day, Alÿs replicated the scene and walked around the city, only this time, with a fake gun. His work brings us to our senses not to simply watch the footages but to carefully point out the differences between the real and the dramatization. This leads us to question our discernment of the authentic and the fictional, and presents a familiar situation where media plays a vital role in manipulating reality. In another video performance, Michelle Lopez takes us on a challenge to guess something that we can’t see. In her piece, “Invisible Object,” different men and women with eyes closed describe an invisible object. They try to tell us about it through words (and even in different languages). However, when words fail them, they frustratingly use their hands and depend on gestures. Inspired by sculptor Alberto Giacometti’s “Hands Holding the Void,” Lopez’s work plays on our capacity to imagine objects that are physically absent and yet manifest in our mind to fill a space we have visualized but eventually vanish once we open our eyes. 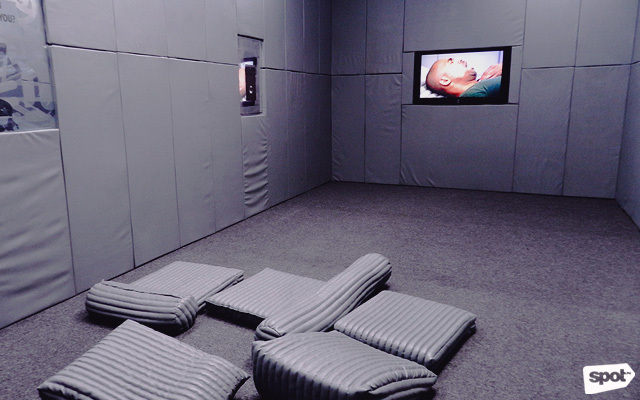 Meanwhile, you are encouraged to release your repressed political feelings in “Primal Speech,” where a therapy room has been set up, complete with punching pillows and padded gray walls. The public is encouraged to make themselves comfortable inside the room while expressing their anger. While performances are not seen in Erick Beltrán’s “Demonstrative Figures (Assimilated),” movements can be understood through the site-specific work covering almost half of the museum. 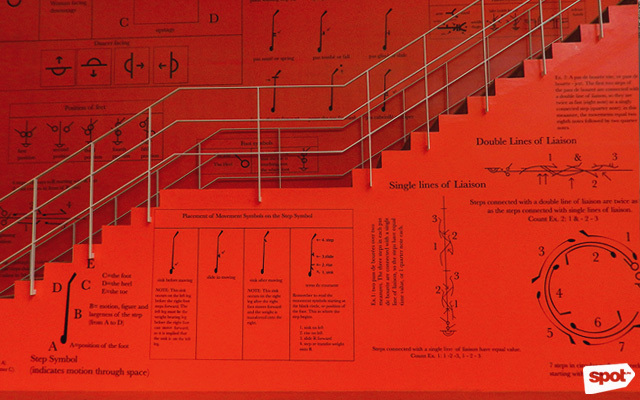 The large orange installation shows dance notes (similar to music notes) of Sarabande—a slow court dance from the Baroque period believed to have originated in Mexico. The artist used the Raoul-Auger Feuillet’s system of dance notation to indicate the dancers’ movements and he inserted protest gestures linked to previously colonized societies. Re-enactments runs until September 10 at Museum of Contemporary Art and Design, College of Saint Benilde's School of Design and Arts, Dominga Street, Malate, Manila. 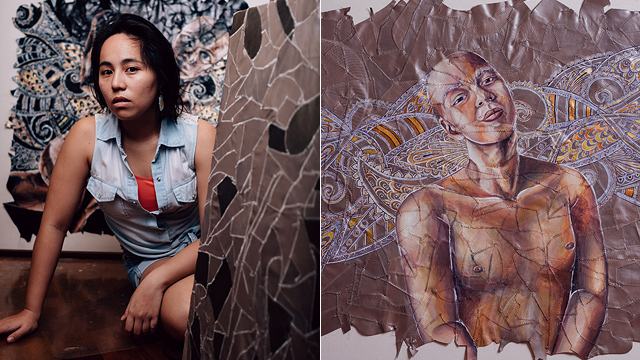 For more information, visit MCAD’s website.